We visited GITEX 2017 a technology expo held at Dubai World Trade Center in September 2017. 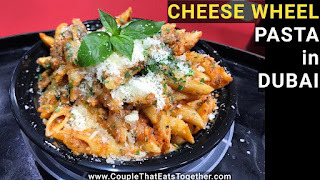 So for lunch there were lot of food trucks parked in exhibition centre and Mia Strada food truck caught our attention as they were preparing pasta in a big cheese wheel. Yes you read it right it was a cheese wheel. We ordered penne arrabbiata pasta with chicken. The pasta is prepare first on regular pan and then transferred to cheese wheel to completely coat with cheese. We loved the fact they had fresh herbs plant on the food truck. If you are in Dubai don't miss it.